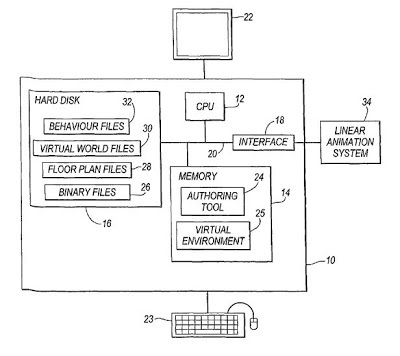 The ‘728 patent describes an apparatus for controlling an interactive virtual environment. Objects in the environment may be attached or detached from other objects. Whenever a character attaches itself to an object, the character will react to things in the environment along with the object. The character and the object will attach themselves together and all animations will reflect this. The game has set animations depending on what the character is holding. Thus, animations will be differently if a player holds an object than it would if he is empty handed. An apparatus for controlling an interactive virtual environment is disclosed. The apparatus comprises means for defining a virtual environment populated by objects, the objects comprising at least avatars and props, objects within the virtual environment may be dynamically attached to and detached from other objects under user control. A prop has associated with it an animation for use when an avatar interacts with the prop, and when the prop is attached to another object the animation remains associated with the prop. When an object is attached to another object, it may inherit the movement of the object to which it is attached. 1. Apparatus for controlling an interactive virtual environment, the apparatus comprising a unit which defines a virtual environment populated by objects, the objects comprising avatars and props, wherein objects within the virtual environment may be dynamically attached to and detached from other objects, characterized in that one or more of the props has associated with it information defining one or more animations which may be performed by an avatar when said avatar interacts with the prop, the avatar being operable to query the prop for the information defining the animation that the avatar is to perform when the avatar interacts with the prop, and wherein when the prop is dynamically attached to another object, the information defining the animation(s) to be performed by one or more of the avatars during an interaction with the prop, remains associated with the prop.